I bought a book online for my Kindle titled Works of John Bunyan—Complete. For a few dollars these days you can buy a lot of reading material in electronic format. I have learned to endure it and profit from it although I’ll always enjoy reading the actual book much more. One of the downsides of electronic books is that the formatting may be very handy and it may be very terrible. In the case of this book it is more toward terrible and a long way from handy. 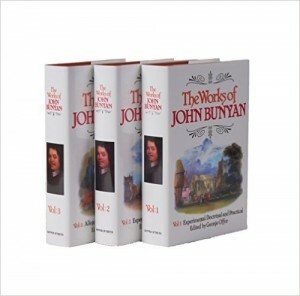 The only index to the “complete works” of Bunyan is to the first book which is a biography, and a very good one, by George Offor. This covers 3% of the material but none of the rest of the material has any listing or index. Beside my complaints about the electronic index, or lack thereof, the Memoir by Offor was very good and detailed. Although I have read a lot of Bunyan history, including his own biography, Grace Abounding, this was especially good and detailed. I take advantage of the Kindle highlighting so that I can save quotations or mark sections for later reference. For purposes of Bunyan’s history I’ve marked a number of important things about his life in this volume. *By law in those days you were allowed recreation on Sunday without penalty but this was frowned upon by the Church. Bunyan played “Cat” on the Moot House Green to antagonize his Christian neighbors. *He quit as a “bell-ringer” at the church because a church bell fell on a man once and he was afraid of the same fate and he was already under great conviction as a sinner. *He came under conviction of salvation when he overheard two poor women speaking of their faith while he was about his tinkering. *He was led to the Lord by “Holy Mr. Gifford” the pastor of the local Baptist church, and was baptized in the Ouse near Duck Mill Lane (a spot that my sister, Debra Conley, and I discovered after much reconnoitering). *Bunayn served as deacon in Gifford’s church before he sensed the call of God for preaching. *He was arrested for preaching in an unlawful assembly and for not using the prayer book of the Church of England. He knew before he went that officials were waiting to arrest him. *He was placed in the county gaol (“jail”) for twelve years and then in the city gaol on the bridge over the river Ouse for another year. During this time he wrote many books including most of Pilgrim’s Progress. *At first the manuscript to his famous work lay in a drawer until someone encouraged him to publish it. Now it is translated into more languages and in more copies than any other book except the Bible itself. *Upon release from the gaol, Bunyan continued pastoring the believers in Bedford. He often traveled to London to preach at Zoar Chapel, a building which no longer exists but is marked by Zoar Lane near the spot. *On one such trip in which he rode in bad weather, he became sick and died in a friend’s house in London. *He was buried in the Dissenter’s graveyard (Bunhill Fields) where his grave can be visited and seen to this day.